Building a deck can be an overwhelming project for a homeowner. There is now such a variety of products to choose from in each category: wood, composite and vinyl. Building codes can sometimes be hard to decipher depending on your township. For such a large investment, homeowners want to make sure the job is done correctly and looks great. Our estimators can give you their honest advice in regards to the scope of your deck, help you choose materials, and work within your budget. We provide our customers with a fair price for their project and offer many payment options. If you are interested in having a deck installed, or simply upgrading the deck you already have, give us a call to set up your free estimate today. 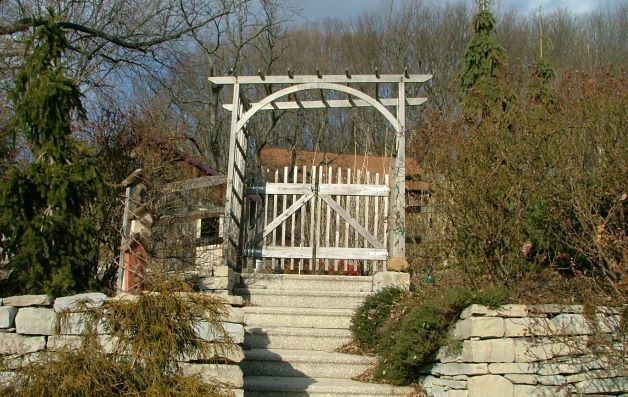 Custom wood arbor measures 5’w and includes trellised sides and a continuous arched gate with lockable latch. Arbor was included as a gate during the installation of the 3Rail split Rail fence with green weld wire. Contact us for more information on Arbors and Pergolas. A well crafted pergola provides shade, elegance and a boost to a home’s value. Pergola sizes are customizable and they come in a variety of colors including black. Vinyl pergolas are maintenance free and carry a limited lifetime warranty. Vinyl arbors are typically much smaller than pergolas but come as the same maintenance free product and carry the same limited lifetime warranty. Arbors can be ordered to include decorative accents such as gates and benches. Wood pergolas and arbors are available in Western Red Cedar and can also be ordered with a gate kit option.